The appointed Ramsey County sheriff is seeking a nod from voters against a challenger who spent years in the job. 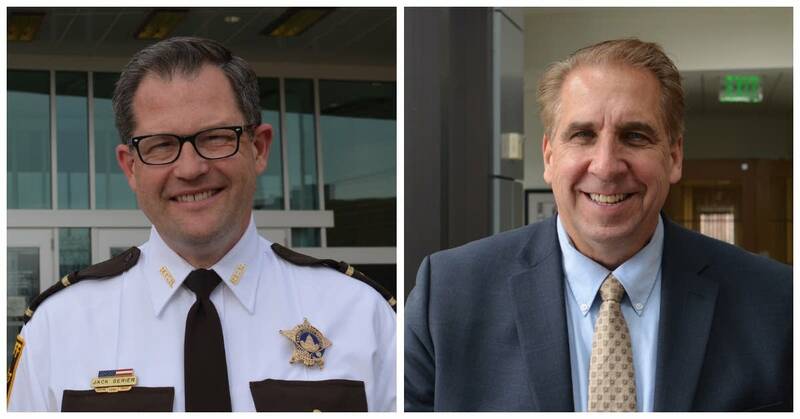 Sheriff Jack Serier and Vadnais Heights Mayor Bob Fletcher have spent much of their careers in law enforcement. Both worked as police officers in St. Paul, steadily moving up the ladder there before heading to the sheriff's office. Serier, appointed sheriff in January 2017 after Matt Bostrom decided to leave his position to take a job at the University of Oxford, said he has more to do. "There's a lot of social and philosophical change that I'm working on here in law enforcement here in Ramsey County, and partnering with other people in criminal justice and beyond," Serier said. Serier says he'll work on issues of race and equity in policing and will stress four principles in employees: respect, responsibility, honor and truth. "We're not looking for perfect people, but we're looking for people who have lived out those traits in their lives and in turn for others will provide a heart of service in everything they do," Serier said. Bob Fletcher was first elected sheriff in 1994. He held that position until he lost a re-election bid in 2010. "Public safety has always been my passion. I started there in St. Paul as a young police officer, worked through the ranks and as the juvenile unit commander I found my passion to help kids," Fletcher said. Fletcher wants to address opioid addiction, restart juvenile crime prevention programs and to change hiring practices to allow people to apprentice in law enforcement rather than require a two-year degree. "Expanding the pool of people we can select from will help us get a more diverse police community, but not just diverse in terms of race, but diverse in terms of background experience, and it's really a top priority for me," Fletcher said. Both Fletcher and Serier say the jail should do more to help those who need mental health and drug treatment. In one difference, Fletcher said deputies should have body cameras immediately, especially after a suburban police officer shot a motorist to death. "It's been 27 months since Philando Castile was shot, there's no excuse for the sheriff's office not to have body cameras by now," Fletcher said. Deputies are supposed to get body cameras in 2020, and the equipment is being tested now. Serier said the body-worn cameras need to be better integrated with those on dashboards. "These are multimillion dollar projects and you just can't pull them off the shelf and plug them in," Serier said. Fletcher's tenure as sheriff wasn't without controversy. His deputies conducted what he called "preventive" arrests of counter protest organizers prior to the start of the Republican National Convention. Ten years later, he stands by that decision. Fletcher was also on the oversight council of the Metro Gang Strike Force, when state and federal agents found that members of the force had been taking evidence and money from raids. Fletcher says he was not in a direct leadership role on the strike force when it happened. "I was very troubled by some of the actions of the gang strike force members as should everyone have been," Fletcher said. "I'm the only one of the 12 members of the oversight council that took action to discipline three of the members of the strike force." Fletcher wants to bring back juvenile crime prevention programs that he implemented when he was sheriff and wants to see more scrutiny over conceal and carry permit applications. Serier says he's very proud of the work his department has done in taking over policing and restoring trust in Falcon Heights in the aftermath of the Philando Castile shooting. Serier also says he's kept within budget even as staffing levels at the jail increased, more than half are women and/or people of color. "We continue to work very tirelessly on making sure that we're an organization that reflects our community, and is understanding and trains on and continues to delve into the issues of implicit bias in the criminal justice system," Serier said. "How do we have to think about our own thinking as individuals, but also our systems thinking?"